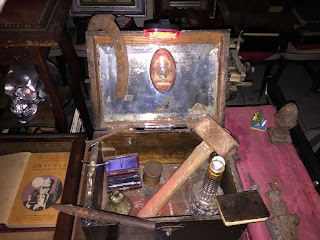 Last night at 7:00 PM we hopped into a taxi for our arranged visit to the Vampire Museum. We weren't sure what we would find, but we were looking forward to it! At 7:00 you might think most of the rush hour in Paris would be just about over but no no no, the streets were bumper to bumper. 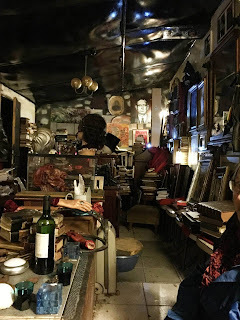 We were to meet Jacques Sirgent, the proprietor of the museum, on a street corner in Les Lilas, just outside Paris, and as he led us down a small street and into an absolutely dark alley, we understood why. We never would have found it ourselves. We soon came to a red door with a small sign that said "Musee," and were led through a darkened courtyard and into the museum itself. The museum was packed full of items from floor to ceiling. M. Sirgent has signed photos of every actor who's played Dracula, except Christopher Lee (I think he said). I was especially drawn to the many ancient books he has, some going back to the early days of the printing press. 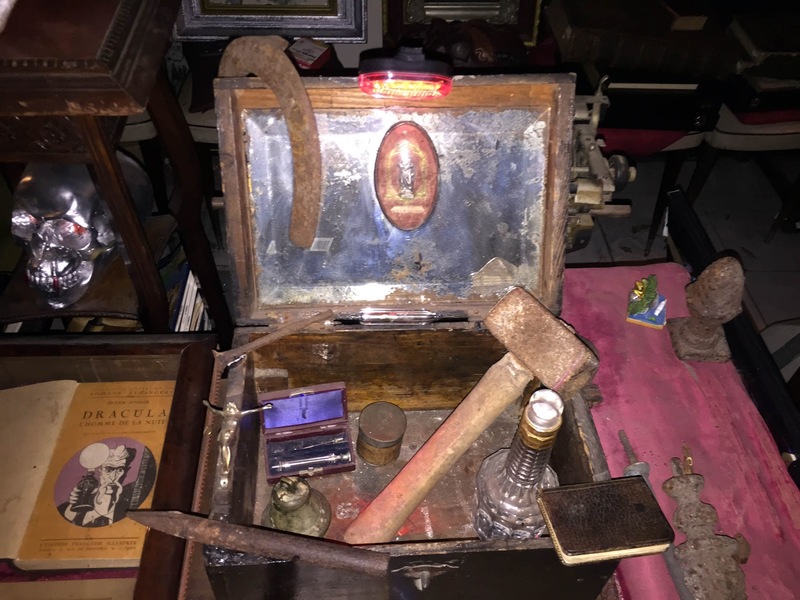 He also has many, many artifacts, all of which have stories behind them, and his prize, a signed photo of Bram Stoker himself. 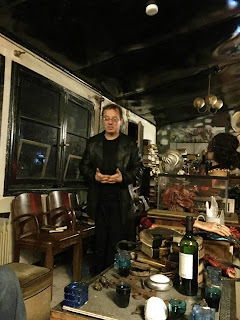 M. Sirgent is an impassioned lecturer on all kinds of topics, from vampires and werewolves to the nature of good and evil to the shortcomings of the Catholic church and the mistreatment of women throughout history. And lecture he did, for several hours! It was fascinating, but in the end we were tired and had to say our goodbyes. And we were hungry as well, because the "small buffet" that had been arranged in our emails never appeared. Although he offered us wine, he appeared to have forgotten about our dinner, and we were too polite to ask. So when we got back to the apartment, after 10PM, we gobbled down the bread with cheese and coldcuts that, happily, we had stored in the refrigerator. Do we recommend the Musee des Vampires? We offer a strong "maybe"! If you are passionate about vampires and want to be filled with information, stories, and personal experiences, you may well enjoy spending a few hours with M. Sirgent. On the other hand, he may be moving the museum to China at some point, so be sure you check on whether it's still in Paris. 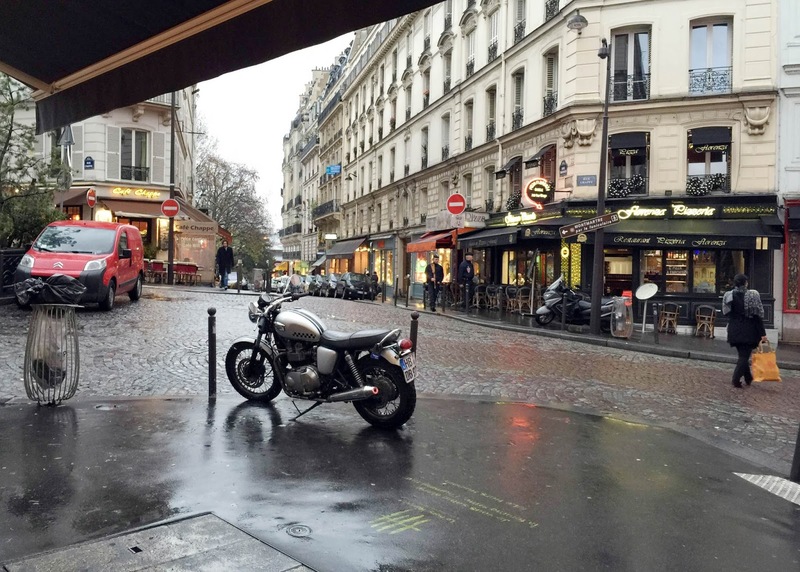 Our own little corner of Montmartre -- we're staying in the white building on the right. Today it's been rainy all day, so it was a day for exploring more of our neighborhood, buying souvenirs, and napping. We planned on staying close to home because so much rain was predicted that they were warning of flooding -- but that never materialized. It's supposed to rain again tomorrow, but I think we need to get out and about somehow, because the Musee D'Orsay still awaits us! Can we come home without having visited every major museum in Paris? I think we can. Despite the very unusual circumstances during our visit, we can come home from Paris having had a wonderful experience of staying for two weeks, getting to know our neighborhood well, having "our" bistro across the street where the waiter knows what Grace wants before she even says it (a cheeseburger and fries, with avocado on the hamburger, which they had never heard of), and having unique experiences like creating our own perfumes and having a guided tour of Ile de la Cite. We have four more days, which include an overnight trip to Bruges for Ed and me. We'll see what we can see before we come home! Glad you are ebnjoying yourselves. It was really windy and rainy here in Saint-Aignan today too. Typical November weather. It really is wonderful, and overall the weather has been great. Thanks for your comment.